The National Health Service recently banned homeopathic medicines along with other treatments that were "relatively ineffective, unnecessary, inappropriate or unsafe for prescription". This is a massive blow to the alternative medicine industry, one that's already been plagued with bad science and malpractice. Now, the NHS is going to use these funds in order to research and provide more advanced and higher quality treatments for their patients. The Aga Khan Ethical Framework cites Islam's history of scientific research in two short paragraphs (on pages 4-5) and says: "when the great plague, the Black Death, struck Europe and Asia, Muslim physicians rejected the widely entrenched superstition that the scourge was a divine retribution... [ibn alKhatib] wrote that the existence of contagion was established by experience, study of evidence of the senses, by trustworthy reports..." As an Ismaili Muslim today, I'm proud to reject the superstition of alternative medicines in favor of empirical research and, although I'm not British, fully support the NHS in their pursuit of tangible healthcare. There's a lot that goes into homeopathy. You can read a more in-depth history here, but for the purposes of this post, I'm going to focus on the "law of infinitesimal doses". Invented by German physician Samuel Christian Hahnemann, this law says that when drugs are diluted in water, their potency increases. In simple terms: if you take drugs and add stuff that's not drugs, it makes more drugs. On the surface, it may seem like that doesn't make sense. But, if you dig a little bit deeper and look at the laws of thermodynamics, you'll notice that it still doesn't make sense. Nowadays, the idea is explained with the concept of "water memory", that the water somehow takes on the properties of the drug it's mixed in with, but testing reveals that it actually becomes plain water, with little to no drugs in it. Not only is there no consensus to homeopathic practices working, but there's also no pseudo-scientific consensus: the people that make the stuff can't agree on how it's made. That's why Professor Edzard Ernst from the University of Exeter (a name I'm stealing for my Game of Thrones OC) said: "We have now known for decades that the most reliable studies fail to show that highly diluted homeopathic remedies are more than placebos." By know you're double-checking to make sure you're reading the right blog. You are: this is the Ismaili one (my other blog is white and blue, this one is off-white and slightly different blue). So, why would I be bringing up homeopathic medicine in a blog about religion? Well, there is one practice in Jamatkhana that seems reminiscent of homeopathy. In Jamatkhana, we have purity water (ابالشفاء "ab e shafa" in Arabic/Persian, also healing water) that we drink on Fridays and special occasions in order to purify our souls. There's a whole ceremony based around setting it up and distributing it to the people. But where does this purity water come from? It comes from the sink. Or at least most of it does. The water that's distributed to the congregation comes from two sources. Most of it comes from a jug under the table ("paat" in Gujarati) which is filled from the sink. The other bit comes from a small, usually decorated bottle on the side of the table. The small bottle is what originally contains the purity water. That purity water comes from the Imam, who blesses it personally. However, every jamatkhana has one of those bottles, and most households do as well. And the imam can't bless every single one of those bottles, he wouldn't have time for anything else. Instead, he blesses some water and that water is then distributed to the Jamat around the world. You can start to see where I'm going with this. How much water would the Imam have to bless, for everyone around the world to get some? 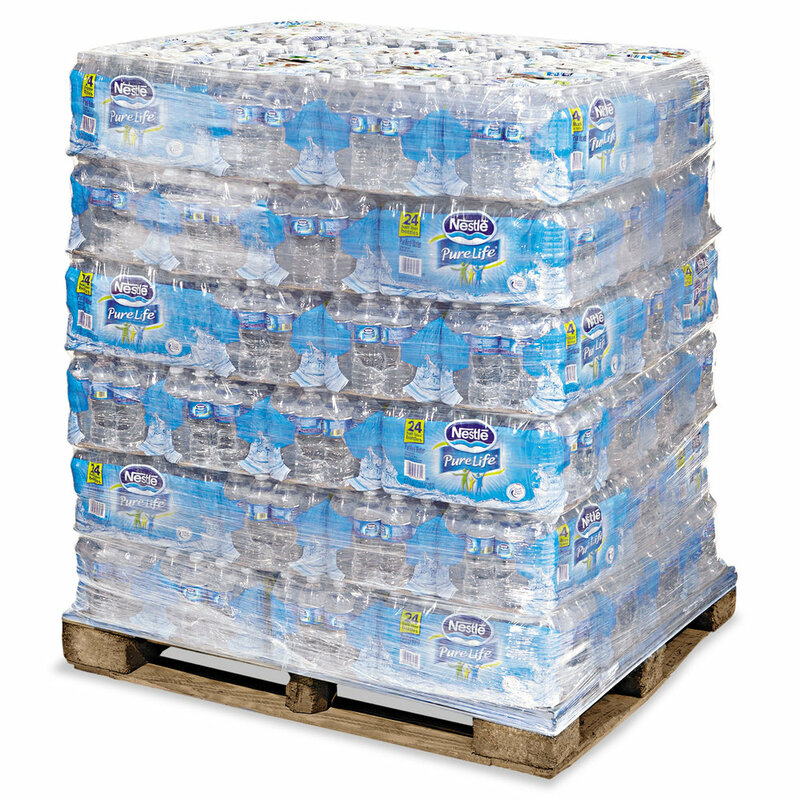 If the imam blessed one pallet of water, like the one above, each Ismaili around the world would get a resounding 1.2 drops of purity water. Obviously, when the ritual is performed, each Ismaili partakes in more than a drop of the purity water. The blessings of the Imam act like the drug, giving the water its original purification properties. But, just like homeopathy, by the time the water reaches the congregation, it's been diluted thousands of times until any original blessings are virtually (or actually) non-existent. The purification from the purity water doesn't come from any inherent properties of the water, but from the person partaking in the ritual. You'll remember from Space Jam (and if you haven't seen Space Jam, stop reading this and go watch it) that there was nothing in Michael's Secret Stuff that gave the Tune Squad superpowers, it was just tap water. However, when coupled with the determination and extra effort of the 'toons, it was used to a marvelous extent. So while Michael's Secret Stuff didn't do anything, drinking it (and the circumstances around drinking it) that allowed it to work. Likewise, the purification water isn't going to purify you; you have to do that yourself. The purification water, and the ritual around it, simply act as a reminder to pursue that effort. Like many things in Ismailism, it's not about the material, it's about the intent. If you intend to be a kinder person, or be more humble, or whatever that "purification" means to you, then the action of taking purification water acts as a symbolic first step in making that happen. This leads us to the other common term for purification water: wish (نياز "niaz" in Persian). Taking the water in an intention of purification, not purification itself. This idea is also reflected in the Quran which says: "Man shall have only that for which he labours" (The Star: 39, translation from (hey, look at that) the AKDN Ethical Framework). So, the effort of purifying one's self can only come from their self, not from magic water. So why use the stuff anyway, if it doesn't do anything? According to placebo-researcher Professor Ted Kaptchuk: "The placebo effect is more than positive thinking — believing a treatment or procedure will work. It's about creating a stronger connection between the brain and body and how they work together" (source). Similarly, the ritual of the purification water creates that strong connection between the intention of being purified and the act of purifying one's self. By now you're thinking: "Aqil, you just told me this doesn't work, why should I even do this anymore." In 2014, Professor Kaptchuk (the abovementioned placebo-researcher) researched placebos. He found that people who took placebos, knowing they were fake, still felt the effect more than people who didn't take medicine at all. And if that works for migraines, that can also work for ritual purification. So while there might not be anything in the water, drinking the water with the right intention gets the job done. Aug 30 Why do we pray to the Imam?